What is recurring billing, subscription billing? Recurring billing is a payment model that allows companies to invoice their customers based on a schedule that the company specifies (i.e. once a month, once every quarter, etc.) The most common forms of recurring billing include subscriptions, membership dues and payments that are made under an installment plan. Why is recurring billing a popular option for companies using a managed services model? Companies that use a managed services model or even a hybrid model with some one-off product and service sales will find recurring billing indispensable. This form of billing automates much of the invoicing process. Invoices are no longer sent out manually, but automatically; and – if the customer agrees – can be automatically deducted from their bank accounts. Not only does this free up an immense amount of time and resources for the company, it also frees up time for the customer, who no longer needs to manually enter in his or her billing information every month. It’s a win-win for both parties involved. Is recurring billing software flexible enough to allow multiple payment models and pricing structures? Yes. It’s common practice today for companies offering recurring billing software to add support for a wide assortment of payment models and pricing structures. Whether the payment is recurring, non-recurring, or there are renewal terms that must be agreed upon, recurring billing software is often up for the task. Can payments be managed and tracked with recurring billing software? Absolutely. Recurring billing software gives companies an unprecedented level of visibility and management tools for both recurring and non-recurring payments. A company can view the entire process, from invoice to payment, all in one place. On top of that, they have complete control over when invoices go out and what notifications are sent to customers to ensure a timely payment. Is recurring billing available as a cloud-based Software as a Service (SaaS)? It is, and it’s becoming an increasingly popular option for businesses. Cloud-based recurring billing software is accessible from anywhere with an Internet connection. This increased mobility, combined with the freedom of never having to purchase or upgrade software, make it a very temping option for both small and large businesses alike. What are the benefits of offering FinancialForce.com’s Recurring Billing on the same platform offered by Salesforce.com? 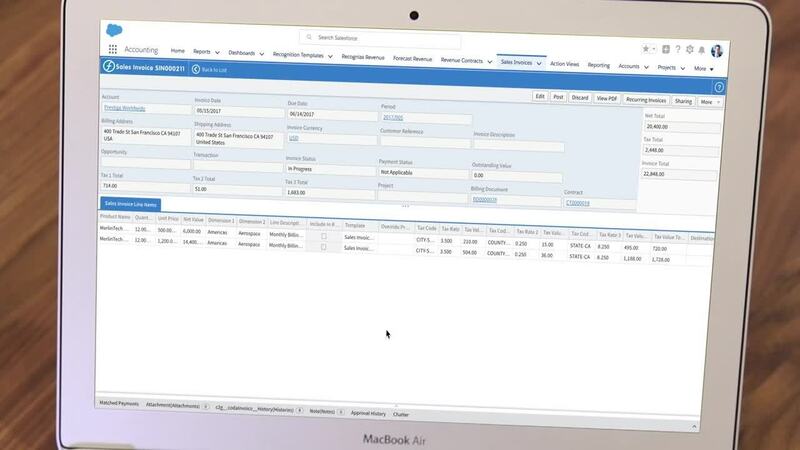 When businesses choose FinancialForce.com as their recurring billing solution, they’re taking advantage of one of the most successful SaaS platforms ever invented: Salesforce1. Customers that already use Salesforce CRM find it simple and convenient to have all of the front and back office processes handled in one place. With FinancialForce Recurring Billing software, companies can generate proposals for time, materials and options, and manage tangible and non-tangible goods all in a single contract.